Allergy Information: Produced in a factory that handles celery, mustard and sesame. May also contain traces of peanuts and nuts. Agar Agar is a natural vegetarian gelling agent. It is often used to set high acidity foods such as lemon or rhubarb. Also used to make panna cotta and jellies. With a strong, pungent flavour and aroma these high quality peppercorns are a versatile seasoning for just about every savoury dish. 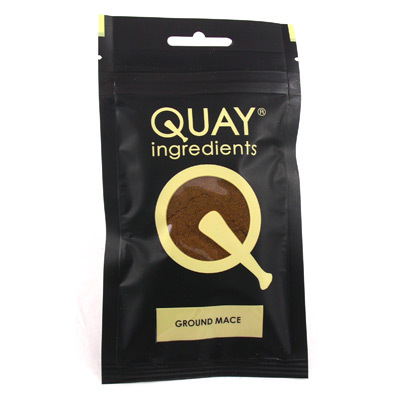 Celery salt is used to flavour soups, stews and casseroles. Delicious with quails’ eggs. Often used in Indian dishes, mango powder gives a sweet and sour flavour. Also known as ‘amchur’. Low Laithe Barn, Wigglesworth, Skipton, North Yorkshire, England BD23 4RQ. All our products are GMO free and contain no artificial colour, flavour, or preservative. Copyright (©) 2000-2018, Quay Ingredients Ltd. All Rights Reserved.